Stanford wins The Prestige at PGA West for its second team title while Patrick Rodgers gets his 7th career individual college. Stanford brought its entire team (except Shane Lebow who is injured) to play in the 14th Prestige held at PGA West's Greg Norman Course in La Quinta, CA. The strong field included 6 teams from the deep Pac-12 conference. The final leaderboard is shown below. 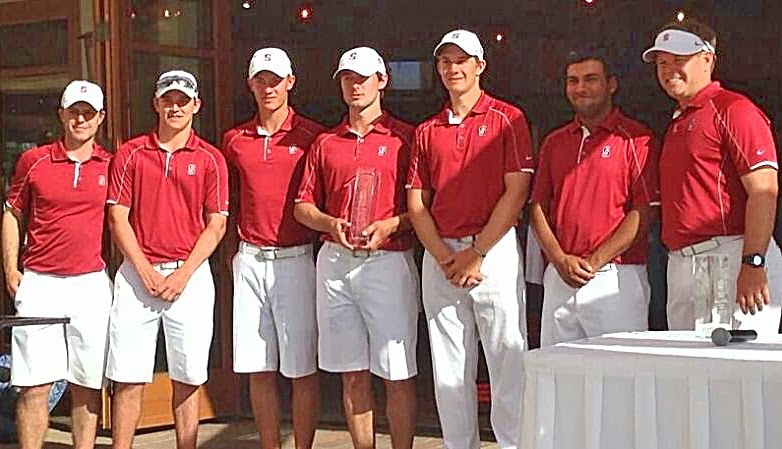 Stanford held on to win its second team title this season by 2 strokes over a hard charging Washington team that carved 12 strokes off the 14 stroke lead going into the final round. The team win was led by a 7th career win by Patrick Rodgers (65-68-71 204 1st) who was closely followed by Cameron Wilson who finished tied for 4th overall (68-70-69 207 T4). As an individual, freshman Jim Liu had a strong tourney as he tied for 7th (74-67-68 209 T7) - see below. The two leaders were followed good contributions by David Boote (71-70-72 213 T24), Maverick McNealy (65-72-77 214 T25) and Viraat Badhwar (73-72-70 215 T28). Viraat's important final round was highlighted by 5 straight birdies starting at #8, a run that moved him 3 under on his round. A double bogey at #13 marred an otherwise excellent round. “I’m really excited for the team to pick up our second win of the season, and hats off to Washington for a solid round to finish the tournament,” Knowles Family Director of Men’s Golf Conrad Ray said. “Our guys held strong and finished well. We had contributions from all players in the lineup and it was neat to see Patrick Rodgers win another individual title.“We’re looking forward to working on a few loose ends to get ready for our next event.” (Southern Highlands March 7-9). Patrick's individual win moved him into a 2nd place tie with 4-time All-American Joel Kribel ('99) on the career win list at Stanford, behind only Tiger Woods' ('96) 11 wins in his two seasons. Patrick's final round was a steady one with his two birdies and two bogies preserving his 1 shot victory. Cameron tie for 4th continued his excellent season that finds him #1 on the team with a 69.61 scoring average and 5 our 6 top 10 finishes. Patrick is close behind Cameron in scoring average at 69.83. Of special note on the individual front was the play of freshman Jim Liu who charged up the leaderboard to finish tied for 7th overall with rounds of 74-67-68 209 (T7). Liu's scorecards can be found below. A solid 4-under par second round score of 280 (3rd best on the day) extended the Stanford lead to 14 strokes over Washington and 17 over Oregon headed into the final round. Balanced scoring was led by Patrick Rodgers (65-68 133 1st) leaving him in 4 shots ahead of the field in the individual competition. Tied for 2nd overall was Maverick McNealy (65-72 137 T2) with Cameron Wilson another stroke back and tied for 3rd (68-70 138 T3). David Boote is tied for 14th after a steady 1-under 70 (71-70 141 T14) and Viraat Badhwar is at 145 after a 72 (73-72 145 T37). "Our guys hung in there today and extended our lead, which was the goal going into round two," Knowles Family Director of Men’s Golf Conrad Ray said. "The hole locations were more challenging and the birdies were a little harder to come by. Tomorrow will be good training for our guys to play with a lead, and we hope to come out on top." stands tied for 14th at 141 (74-67 141 T14), Dominic Francks is at 150 (76-74 150 T54), Patrick Grimes at 153 (79-74 153 T62) and Keegan English at 160 (82-78 160 T69). Weather conditions in the desert were perfect with temperatures in the mid to high eighties and light winds. Team and individual scoring is included below. sunny conditions between 70 and 80+ degrees. Ideal for scoring --- at least for Stanford which raced to a 15-under 269 total giving them an 11-stroke lead over San Diego State. 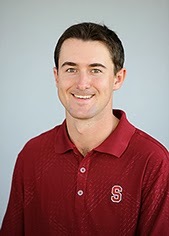 Stanford was led by a pair of 65s by Patrick Rodgers and Maverick McNealy placing them first individually, 3 strokes ahead of the four players with 68s including Cameron Wilson. Patrick's round included 8 birdies and one double bogey as he shot a 30 on the back nine while Maverick had 7 birdies and one bogey and a 31 on his back nine. David Boote was at even par 71 and Viraat Badhwar shot a 73. Playing as individuals Jim Liu shot 74, Dominic Francks 76, Patrick Grimes 79 and Keegan English shot an 82. The top 10 team and individual scoring is shown below followed by the 5 team member scorecards. • Co-hosted by Stanford and UC Davis, the 14th Prestige will be played at PGA West’s Greg Norman Course in La Quinta, Calif.
• Stanford won the 2006 team title after firing a 15-under, led by medalist Zach Miller’s 9-under performance. Andrew Yung (-12) was the 2012 medalist. • In 2013, the Cardinal was fifth at 8-over as Stanford frontrunners Cameron Wilson and Andrew Yun tied for seventh at even-par 213. • The 12-team field includes No. 11 Stanford, No. 17 Washington, No. 22 USC, No. 23 UCLA, Arizona State, LSU, Texas Tech, Oregon, San Diego State, UC Davis, Pepperdine and Stirling (Scotland). • The three-day, 54-hole event will feature 18 holes each day. The lowest four scores of each team’s five players will comprise the overall team score. • The newest course at PGA West and the only Greg Norman-designed golf course in the Coachella Valley is aptly described as being very “challenging but fair.” Sporting only 68 acres of lush manicured turf, 102 white-crushed marble bunkers and shark blue water coming into play on nine holes, the par-72, 7,096-yard course offers a truly Outback experience. • Resting in a prehistoric ocean bed 40-feet below sea level and surrounded by an immense crescent of terra cotta mountains, the course teems with purple, white and yellow wildflowers, while the mix of tall and short native grasses produce different shades of green running almost to silver. The grass covers just 60 acres of tight fairways that taper toward the greens with nine ponds blanketing 18 acres. The demands of this target-style course are a challenge for players of all levels. “Our guys are eager to get down to PGA West and compete. It is a course we know well and have had some success on. If the weather cooperates, the scores are usually fairly low. Our event in Hawaii was a good tune-up. We have focused this week on par-three scoring, which was an area of concern in Hawaii. Seven Stanford golfers competed against another strong field on the Big Island of Hawaii at Waikaloa's King's Course. Cameron Wilson, Patrick Rodgers, David Boote, Maverick McNealy and Viraat Bahdwar make up the 5-man team. Patrick Grimes and Jim Lui compete as individuals. The Stanford Daily provided an excellent recap article of the event with quotes from Coach Ray and Cameron Wilson. The Cardinal was able to move up into a tie for 7th at a 27-under par total of 837 after a final round 7-under par 281, but finished 18 shots behind the impressive 45-under par total of 819 posted by Oklahoma State, who finished 12 shots clear of Washington in 2nd place. Some interesting highlights, lowlights, videos and much more can be found at this Storify website. Stanford was led by an excellent 3rd place finish by Cameron Wilson (67-65-70 202 3rd) who finished only 2 shots behind the winning score of Oklahoma State's Jordan Niebrugge. Patrick Rodgers finished strongly with a 6-under 66 for another top 10 finish (69-70-66 205 T7). David Boote also finished under par and tied for 55th (75-69-71 215 T55) while Viraat Badhwar tied for 78th (73-72-73 218) and Maverick McNealy tied for 89th (72-72-76 220). Playing as individuals Patrick Grimes (68-77-78 223) and Jim Liu (73-80-70 223) tied for 98th. “We hung in there today and moved a few spots on the leaderboard,” Knowles Family Director of Men’s Golf Conrad Ray said. “The competition was stiff, and there’s still plenty of work to do as we move towards the spring. 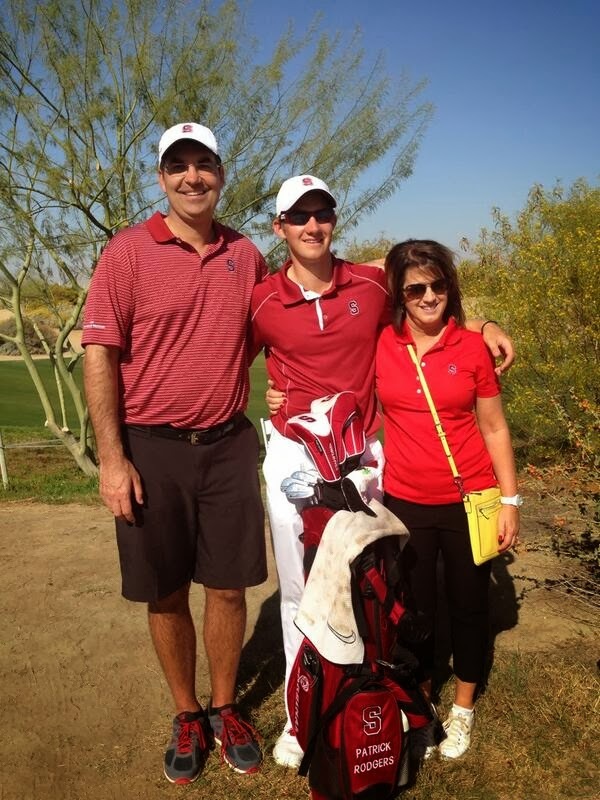 The Cardinal gets back to action at The Prestige (Feb. 17-19) at PGA West in La Quinta, Calif. Team and individual scoring is shown below --- click on the images to enlarge. Cameron Wilson's blazing 65 moved him into 1st place individually and led Stanford to a 12-under par276 team total and within 9 strokes of leading Oklahoma State. Stanford is tied for 10th overall with a very crowded leaderboard at the top -- players are scoring very well in the light wind conditions of the first two rounds of play. Cameron's 2nd round 7-under 65 followed a solid 67 in the first round --- the 65 included 8 birdies and a lone bogey putting him 1 stroke ahead of several players. Patrick's 70 included 7 birdies but also a double bogey and two bogies leaving him tied for 25th at 5-under par. David Boote's 2nd round 69 included two birdies, an eagle and one bogey. The two freshmen, Maverick and Viraat shot even par 72's. The two individuals, Patrick and Jim, both struggled in round 2 with 77 and 80 respectively. 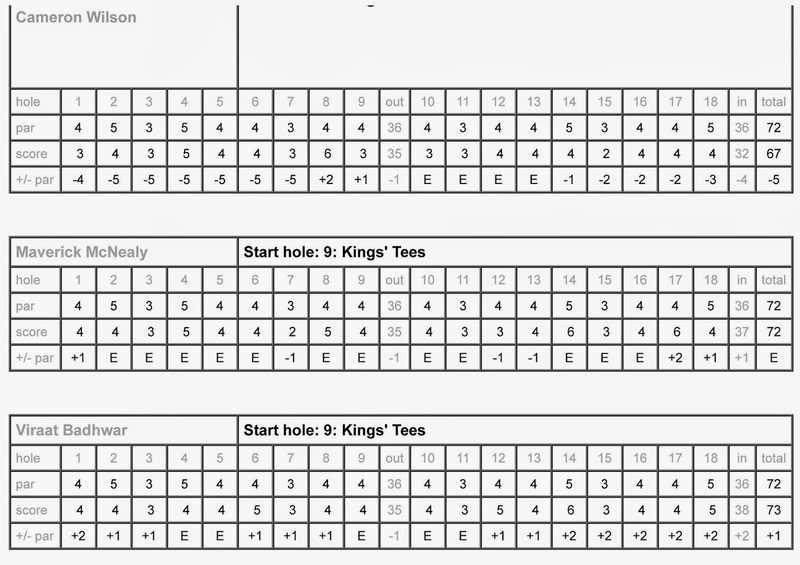 Team and individual scorecards are included below - click to enlarge. Team and individual scoring is shown below as Stanford is led by Cameron's 5-under 67 despite him carding a double bogey offset by 7 birdies. Patrick had a 69, freshman Maverick was even par at 72, freshman Viraat was at 73 and David came in at 75. Stanford is in 12th place 10 strokes behind Oklahoma State. Cameron is 3 strokes behind the low round of 64 on day 1. Scoring conditions were ideal with light winds and partly cloudy conditions. 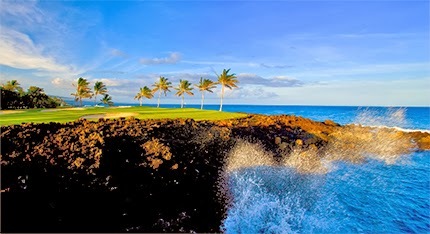 If the ocean breezes kick up the course can play 4-5 shots tougher.